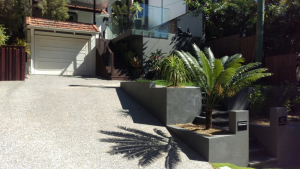 Whether you require a statement driveway to add a visual element to your homes facade, or a suitable and practical clean cut driveway for and carport option or both Brisbane Home Landscaping can build the best quality driveway which complements your home and works with your style. Plain concrete driveways are a cost effective and maintenance free solution for a practical and visually pleasing home frontage. Additionally you may also opt to add a concrete stencil over your plain concrete which is a popular and attractive alternative. Driveway paving is an excellent choice for a long term, quality, strong, attractive and maintenance free solution for vehicle access to your property. Paved driveways are unique to each home as they can be constructed in many different sizes, colours and even textures. Porphyry stone cobbles are also becoming a popular choice among home owners looking for an extremely hard wearing and visually pleasing driveway. Tiling your driveway is a fantastic option for your home. With a growing range of natural stones to manufactured tiles, the choices are endless and the results will not only complement your home but last for many years. With endless opportunities to give your property a facelift, Brisbane Home Landscaping is qualified to build them all.